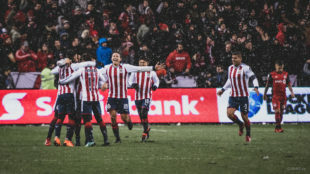 Toronto FC couldn’t end the struggles of MLS in the CONCACAF Champions League, falling in penalty kicks to Chivas Guadalajara at Estadio Akron. The Canadian club dug themselves out of an early hole following their disappointing 2-1 home loss in the first leg. Chivas scored early in the second leg, but goals from Jozy Altidore and Sebastian Giovinco leveled the aggregate score. Toronto looked like they had found the winning goal at the death, but midfielder Marky Delgado skied a sitter that brought back the horrible memory of Chris Wondolowski’s miss in the 2014 World Cup. With no extra time in the final, penalties followed the final whistle. Chivas converted all of their kicks from the spot, and U.S. international Michael Bradley’s miss sealed the trophy for Chivas. His attempt was sent into orbit and the collective memory of historically poor penalties in big moments. Despite captaining his club to the first treble in MLS history, Bradley will now always be remembered for that miss and the U.S.’s failure to qualify for the 2018 World Cup. It’s a shame, because during the 90 minutes of actual play, Bradley had a “man of the match” performance. Toronto FC’s Greg Vanney showed why he is the best young American head coach, breaking away from his preferred 3-5-2 in favor of a 4-4-2 without a natural center back. Traditional right back Gregory van der Wiel partnered with Bradley at the heart of Toronto’s defense. It was a bold move that allowed Vanney’s best passer, Bradley, more time on the ball while avoiding Chivas’ high press in midfield. The U.S. captain was able defend as well as any center back, and his crisp long balls broke down Chivas’ pressure. On the night, Toronto could claim they were the better team, but all that mattered in this one was the final result– a result that ensured MLS would remain without a champion in the current iteration of the tournament. The success of Toronto, as well as New York Red Bulls and Seattle Sounders, might indicate MLS is finally closing the gap on its continental rival. The counterpoint, though, is that all three fell to a Chivas team that currently sits in 17th place out of 18 in the 2018 Torneo Clausura. At the end of the day, it’s Liga MX, not MLS, that can claim the last 13 CONCACAF Cup winners. Yeah, the goal was pretty good, but Max Bretos’ call was perfect. “Laurent Ciman, living on the end of a lightning bolt.” We need more announcing like this. For much of this season, MLS-newcomer Johnny Russell’s stellar play had his name bubbling just below the surface of national attention. Not anymore. The forward burst into the spotlight with a hat trick in Sporting Kansas City’s 6-0 rout of Vancouver Whitecaps. The Scotsman, who is dazzling with the ball in the box, drew a penalty along the way. This will be the only time we’ll dive into the USL ranks, and it’s not even highlight “local” products. Frankly, no local player really deserves recognition this week. So let’s spotlight the spectacular goals of Union alums Pedro Ribeiro (here) and Ken Tribbett (here). Fun fact: each scored as many goals this weekend as Philadelphia has in the last seven weeks! Last week I wrote about how the plethora of clean sheets was a return to the mean after a historic scoring stretch to start the season. Well, MLS showed me after the 46 goals from this weekend matched the league record. How does Montreal waste that performance performance from Ignacio Piatti. The Argentine again showed he is criminally underrated and the best player in MLS on his day. On the other side, LAFC wrapped up their six game road trip to start the season with another win. Their four wins away from home are as many as the Union have since Sep. 5, 2015. Toronto’s decision to rest its starters against Houston Dynamo didn’t pay off. There’s no silverware to balance out the fact they have the fewest points in MLS. The best young newcomer so far this season isn’t a Designated Player. He’s not from Europe or South America. He’s from Schaumburg, IL. and was selected with the seventh pick in the MLS Superdraft. Orlando City SC’s Chris Mueller added another goal and assist a week after scoring in Philly. Atlanta United can now claim the title as the “best in MLS” after their 2-0 win on the road over LA Galaxy. I’ve been saving the headline “Ay dios mio, Gio” ever since Portland got off to a rough start. It looks like it was all for naught after the Timbers handed New York City FC their first loss of the season. FC Dallas are now the only unbeaten side in MLS. Flexibility — what a novel idea!! THAT DOES NOT COMPUTE! THAT DOES NOT COMPUTE! FORMATION CHANGE IMPOSSIBLE! SYSTEM ERROR! SYSTEM ERROR! Full disclosure, I’ve only watch Toronto this season during these concacaf semifinal and final matches. Gotta say, from what I saw, their wing backs failed them miserably. They were absent minded and absent physically at the worst times. Unfortunately the Mexican league still wins. Another year, eh? In the highlights of the LAFC/Montreal game you can see the tightness of the squad after that PK is missed in the 33rd. Immediately after the shot is missed the camera cuts to the shooter and two teammates noticeably comfort him. How does Bob Bradely get squads so new so tight? Has to be from coaching the national team, right? Same basic concept of turning unfamiliar parts into a cohesive whole quickly. FWIW, these MLS Reports have been good. For those of us who don’t have the time or money to watch all of the league games, this is a nice summary of current events with a bit of flavor. Keep it coming. Thanks! Glad you’re enjoying the piece.